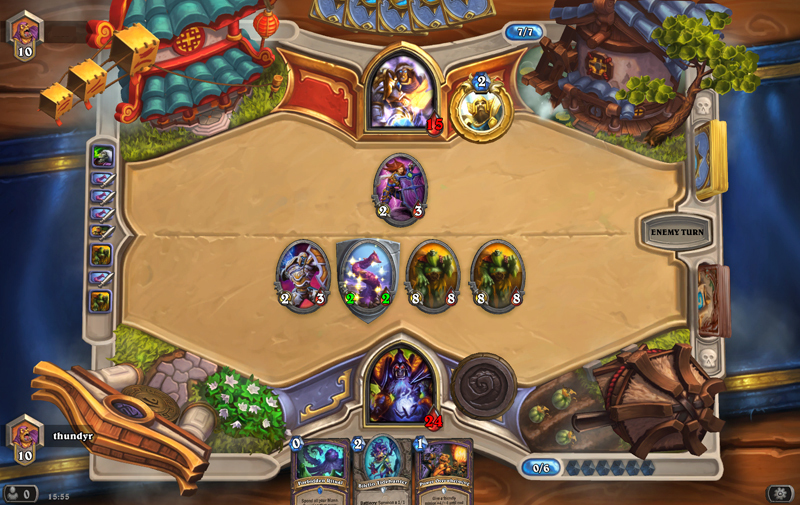 This is the fourteenth part of the Free to Play Journeyman Hearthstone Guide Series. Be sure to check out the other articles in the series here: Part 1, Part 2, Part 3, Part 4, Part 5, Part 6, Part 7, Part 8, Part 9,Part 10, Part 11, Part 12 and Part 13. The chess grandmaster, Aron Nimzowitch once called over a tournament official to complain about his opponent smoking. Smoking was not allowed in the playing area even a century ago and this was a serious offence. The official looked across at Nimzowitch's opponent, and then turned back saying: "But he isn't smoking." For proof he indicated the unlit cigar resting beside the chessboard. "Ah!" shot back Nimzowitch. "But he is threatening to smoke! And we all know that the threat is stronger than the move." Blizzard threatened to change Heartstone significantly with the introduction of the Standard format and a new set designed largely around a single legendary minion that they would give to everyone. It may in fact be an exception in that for once the move has been stronger than the threat, because I have to admit that Blizzard brought back Hearthstone's zing. 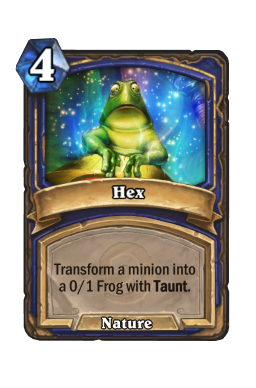 The rotation, the nerfs and the new cards have dramatically changed the environment. It will settle down in time as the pros and other skilled deck builders discover the most efficient ways of realising the new strategies but for now everyone is trying to find that new edge, that new key card that gets the jump on the competition. This means that although the metagame has already settled to an extent, most players have differences or even outright surprises in their decks. It makes designing one's own efforts and especially playing them all the more intriguing. The game really needed this, and Blizzard definitely delivered. The other thing they delivered on was an extra set of storable decks. Having 18 slots rather than 9 makes life SO much better for players like myself who have to tinker with everything but often forget to record original ideas. Bravo, Blizzard. Take a bow, son. *ahem* It's possible that I'm a fool for thinking any of that. But the key for any C'Thun deck comes not from these cards, only one of which is even rare. 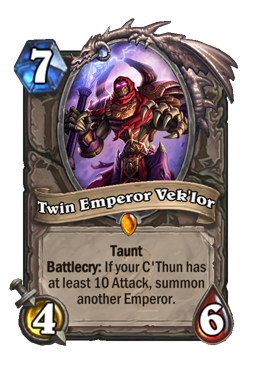 Twin Emperor Vek'lor , Crazed Worshipper , Doomcaller and especially Brann Bronzebeard appear in essentially every list. And for good reason. 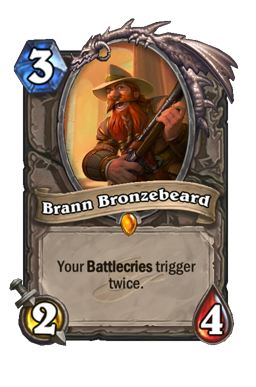 Brann and the Twins is an obvious synergy that can look to have C'Thun double-time the opponent the next turn if Brann survives (and with 3 4/6 Taunts you've done what you can to protect him). 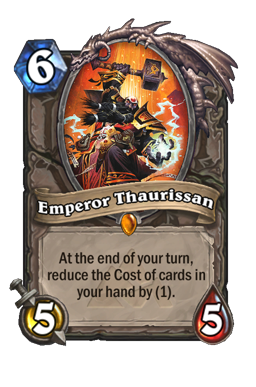 Emperor Thaurissan is a common inclusion, because any discount on Brann or Doomcaller allows one to play C'Thun as soon as one hits enough crystals; when C'Thun dies its attack/power are not reset, and then Brann + Doomcaller gives it +4/+4 and puts TWO copies of the card into the deck. And they said three was a crowd... 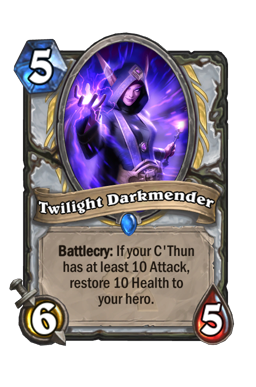 Ancient Shieldbearer and Twilight Darkmender are absolutely necessary to Warrior and Priest C'Thun decks respectively, and are cheap enough to get double their value with Brann. I've beaten a Priest who healed for 20 and then 10. Once. 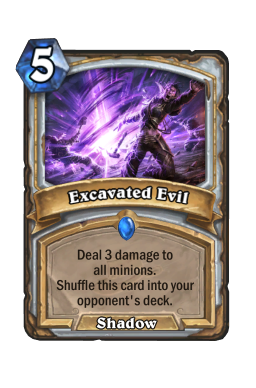 For these classes a bona-fide board clear is absolutely necessary: Brawl and Excavated Evil foremost among them, thought the latter probably not as a full play set given that Auchenai Soulpriest and Circle of Healing are the class workhorse. Without sufficient quantities of these cards I would hesitate to suggest C'Thun as an FTP strategy. It is certainly possible to get C'Thun "up there"; that's easy because the pumpers are, for the most part, common. Surviving long enough to be able to play the legendary minion is quite another matter entirely. 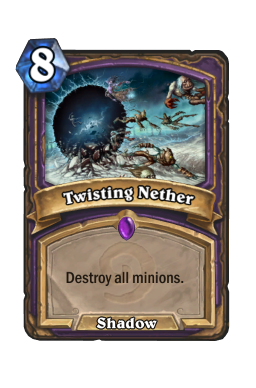 For those playing non-C'Thun decks its vital to understand that Disciple, Beckoner and Twilight Elder are good minions even without their C'Thun effect. They will hit play in the early turns, and they must be dealt with immediately. The most effective strategy is just to stream past them and go to face. C'Thun might get to 18/18, but dead players deal no DPS. Make your deck fast, or make it robust; 2/3 and 3/4 are the new 3/2 and 4/3. You also need an answer to C'Thun itself because you'll never be such a good manipulator of the RNG that all games will go according to your plan. Doomcaller means death isn't final, so a "proper" answer like Hex , Polymorph and Entomb (which resets C'Thun to 6/6 as well as taking it permanently) are strong. Playing Sylvanas the turn before your opponent wants to play C'Thun also counts. Aldor Peacekeeper and similar cards that permanently affect especially a minion's attack make C'Thun a sad panda. 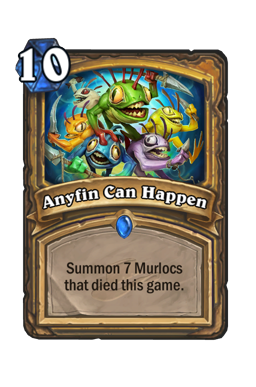 Silencing C'Thun at least makes it start at 6/6 again if it dies. Whatever you do, don't leave home without an answer. 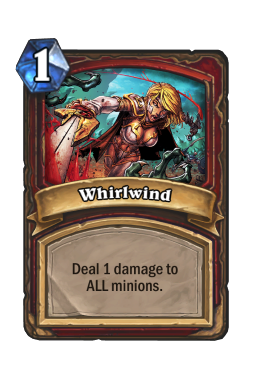 While these answers were usually reserved for other "bombs" like Dr. Boom Tirion or Ragnaros the Firelord , your deck needs to be that little bit adaptable in case the opponent is playing both such end-game closers. 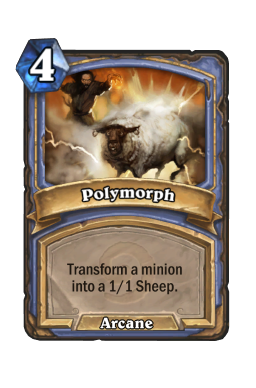 Previously one could get away with just 1 Polymorph, but maybe the time has come for 2. 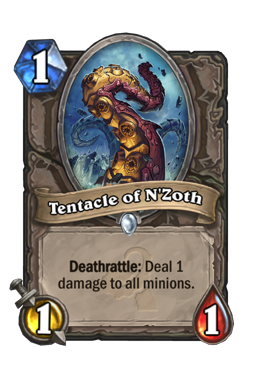 N'Zoth I honestly don't know what to make of N'Zoth. It seems the perfect foil to C'Thun; you wipe out my board, I re-establish it with stickies that you've lost value to once already. And yet the number of N'Zoth decks that have actually worked against me because of playing N'Zoth is exactly 1. 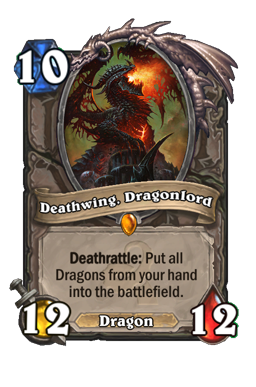 Deathwing, Dragonlord 's Oliver Twist impression is every bit as horrifying as it sounds, is all I can say. The Rogue strategy utilizing huge numbers of deathrattle minions, Xaril, Poisoned Mind and Unearthed Raptor , capping off with 'N'Zoth reminds me rather of the early incarnations of decks built around Anyfin can Happen . Haphazard and unfocussed they struggle, but when the mass reanimation spell has rather more specific targets suddenly things start to work rather better. Besides, Rattle Rogues tend to win or lose long before N'Zoth is necessary or even useful, in my experience. 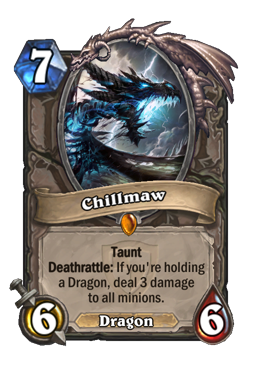 I can't help but feel that a Dragon Paladin sporting the new Deathwing (as my opponent did that day), Chillmaw , Sylvanas Windrunner and Tirion Fordring as the only N'Zoth targets could be quite brutal. 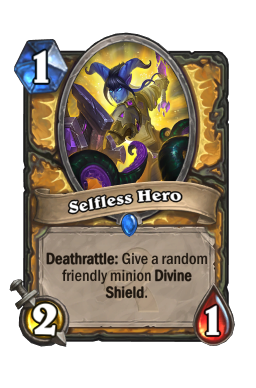 Selfless Hero deserves an honourable mention - the card is quite brilliant. 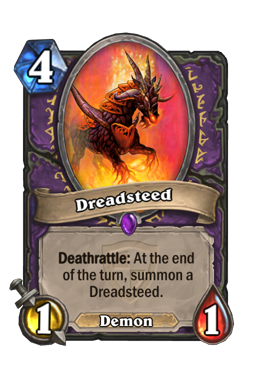 And part of me quietly wonders what happens to Dreadsteed once N'Zoth gets involved... But all of that seems rather complicated and prohibitively expensive for the average FTPer! 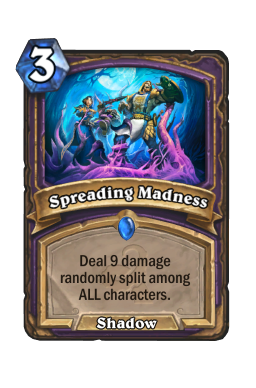 Suffice it to say that N'Zoth is more a threat to the meta than a play that can actually be made at this time. Make of that what you will. Yogg-Saron Okay, I'll say it first: Yogg-Saron is a terrible card. You can't afford to play it when you're winning, and it never does what you need when you're behind. I was "lucky" enough to open one on my EU account. Once I thought it was doing well, turning itself into a 9/9 Taunt only to Earth Shock itself and I lost next turn to my opponent's lone minion which had sat there unscathed through the entire, grizzly performance. Another time I thought it had perfectly cleared my opponent's board with a Flamestrike that was followed by a Pyroblast to the opponent's face, only to hit Twisting Nether to clear my team (which included a Ball of Spiders that filled my hand with bad beasts) and then forced me to overdraw 6 or 7 cards and I ended up losing to fatigue! I definitely have less hair for these experiences. But my golly gosh is it FUN! Just writing that paragraph brings a huge smile to my face and just a little lol; it encapsulates some of the most memorable moments in my time playing Hearthstone. I may have lost all those games, but they were totally worth losing. Nothing equates to the childish, giddy joy of surprise after surprise quite like Yogg-Saron. If playing entertaining decks is your thing, and let's face it we could all use playing such decks once in a while, then Yogg-Saron is LSD on speed. I don't like my Yogg-Saron deck. I think it's terrible. And yet I love it. One day that minion will win a lost game and then I'll be hooked for life. 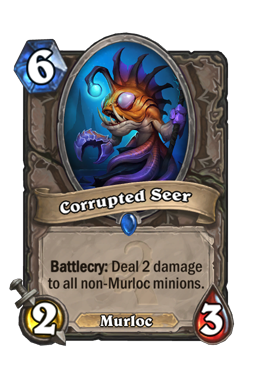 Or at least the next two years anyway... About the only certainties with Yogg-Saron is that you'll get at least one secret, will draw at least 2 cards and it will kill or cripple itself if it doesn't return itself to hand first. It may wipe the entire board. Whether that is something one can build a deck around is another question entirely. Y'Shaarj Never heard of it. Seriously. 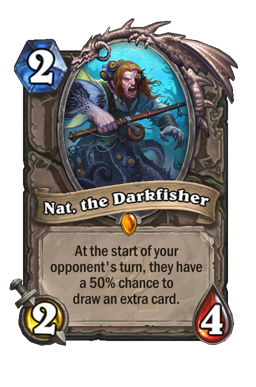 Looks like a 10 mana Nat, the Darkfisher (aka "400 dust"). Either that or once the people who own the card are over their C'Thun fix they discover the card has merit. I'm certainly not crafting it until then! Last time I looked at how my Shaman deck progressed on the first day. This time I'm going to have a look at the two Warlock decks I've been toying with, one of which has evolved and one of which requires me to evolve as a player. Zoo Zoolock has a happy place in my heart, being my go-to deck when I picked up the game on my EU account after quitting for several months (a tale highlighted in the opening article of this series) as well as being the first "serious" deck I was able to construct on my US FTP account. The reasons for this are fairly simple: I enjoy playing Warlock and Zoo decks have a low entry requirement in terms of card rarity. I was fortunate to open 2 copies of Forbidden Ritual in my first set of packs, and with a Darkshire Councilman I knew I had the core of a deck. 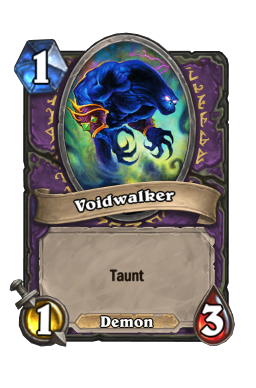 Some obvious inclusions like Knife Juggler and Power Overwhelming and basic set staples such as Voidwalker helped round things out. Or at least that is what I should have stuck with. I did half of that and then midway through creating the deck decided I had to test to see if Grim Patron and Spreading Madness (of which I only had 1) was going to be the next killer combo. Obviously my lone Tentacle of N'Zoth would help trigger the Patrons. I also somehow convinced myself that despite doing my best to damage my minions, many of which had 1 health, Reliquary Seeker would be easy to make as a 5/5. 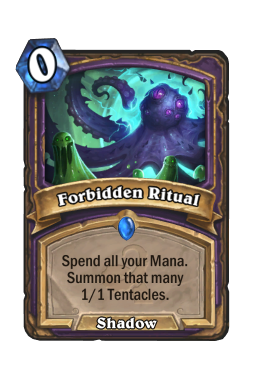 I was quite happy with killing things to make room for Patrons, so my playset of Spawn of N'Zoth got left in the card folder though hesitantly ["I can make 4/4 Patrons," it would whisper to me from time to time]. The deck is at the top on the right. 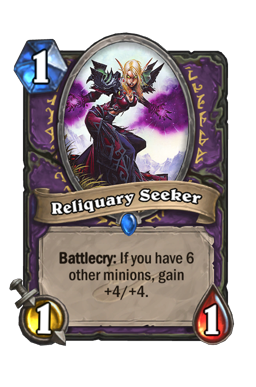 Reno-C'Thun The other Warlock variant that I enjoyed immensely last season on my EU account was Renolock. Although difficult to play that deck was always surprisingly solid against a mixed meta, beating aggro provided I didn't have a "wrong half of the deck" start and able to stay long after the party had usually finished with Lord Jaraxxus against control. It could do everything and even make you dinner. I was a bit more sceptical of the strategy this season given the loss of Antique Healbot and the nerfs to Big Game Hunter and Molten Giant . Having played quite a lot against C'Thun decks I realized two things: a) C'Thun doesn't really need to be that much bigger than 10/10 or 12/12 to get the job done, and b) Warlock has nothing that triggers off C'Thun reaching 10 attack (except the Twin Emperor which I didn't own). I did, however, have at least 1 each of the "essential" C'Thun cards, as well as Brann, Sylvanas and Thaurissan, so I figured I could build a prototype deck on my US FTP account and have some fun with it. Let's just say that I have around 3200 dust on this account, and I am eyeing up a few tasty crafts for this deck unless something else dramatic happens during the next month. The deck is absolutely short of the C'Thun taunts (Twin Emperor and Crazed Worshipper) but there's definitely something to this deck. 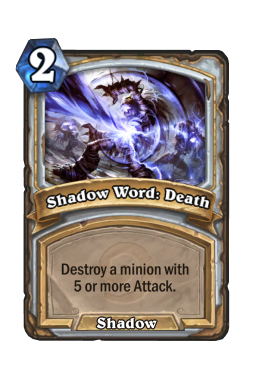 It's pretty bad against Priest tho - Shadow Word: Death for the lesser threats and Entomb for C'Thun - so I may need to revisit Lord Jaraxxus as some point if the control match is hard to win (where previously Renolock was usually house). I'm currently 5-5 with the deck at rank 10 (end of season), and 3 of the 5 losses were just bad play on my part when I had the tools to take control of the game and then misused them like a child with a hammer. The concept is fairly simple though: C'Thun pumpers, taunts, heal, Brann and Doomcaller, board clears and a touch of a handlock feel. I probably need to explain the inclusion of Corrupted Seer . 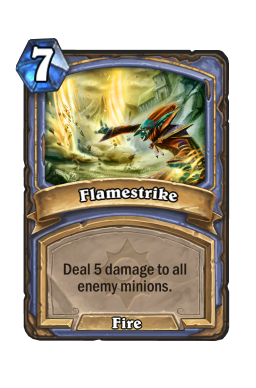 I see it as a 2 damage Hellfire that leaves a 2/3 body and doesn't hurt my life total. 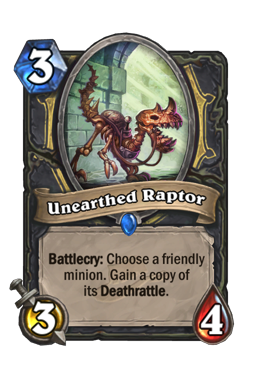 I actually only got it once during the ten games, and it was there to clear out some Hunter post-deathrattle stress disorder. In the games I didn't draw it I definitely could have used it. This deck looks heavy to craft at almost 6000 dust. However on closer examination one sees that Sylvanas is the only craftable legendary minion; the rest coming from Adventure sets or are freebies. 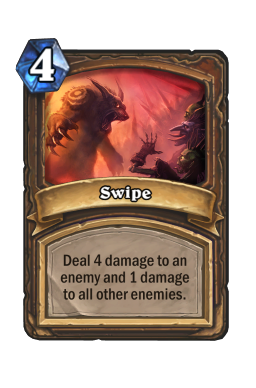 There are 4 epic cards in the deck, including one recently nerfed, and I wouldn't say that Faceless Manipulator was completely necessary. 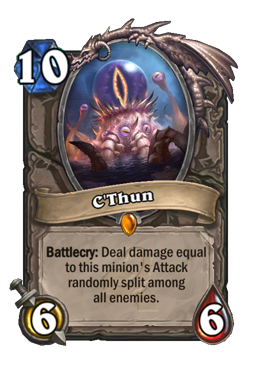 If you're serious about C'Thun you'll have the rest. And that brings us to a close for now. I opened a golden Forbidden Shaping in my pack from a terrible arena run (3 wins, a bad deck didn't deserve even that many), so maybe I'll have a look at some non-C'Thun Priest next time. Until then, keep the comments coming!